A small-town girl with a serious case of wanderlust and a love for animals grew into a scientist, educator, and writer. The process of acquiring knowledge, synthesizing it, and then sharing what she has learned with others is the common thread that underlies her expertise in ecological research, environmental education, and writing. Whether working with peers, students, or a general audience, Sarah finds reward in both the learning and the communicating. Sarah earned a B.S. 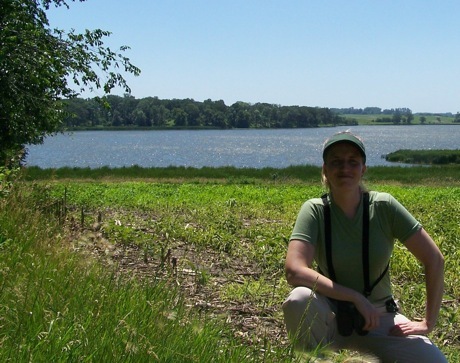 in Ecology, Evolution, and Behavior from the University of Minnesota and spent several years traveling and gaining a wide range of experience in field research and in youth and public education. She earned a Ph.D. in Behavioral Ecology at the University of Miami, with a dissertation on the breeding behavior of a little-known tropical wood duck. After teaching at the university level, Sarah transitioned into the consulting world where her diverse skills and interests found a host of practical applications. She has now been working in the ecological and environmental field for over 20 years – designing and overseeing technical analyses, managing project schedules, coordinating writing and editing of large multi-authored documents, and using her extensive teaching and writing experience to interpret technical information for varied audiences and engage multiple stakeholders. Sarah is a Certified Senior Ecologist with the Ecological Society of America and a LEED Accredited Professional with the U.S. Green Building Council. She lives in western Wisconsin with her husband and their three boys on five acres they have named Three Oaks Farmstead. They are working to connect people to the land, history, nature, and each other through classes, community gatherings, and immersion-based experiences. Sarah’s clients and collaborators have included Dovetail Partners, Applied Ecological Services, Merjent, Westwood Professional Services, Summit Envirosolutions, Malcolm Pirnie (now Arcadis), Minnesota Institute for Sustainable Agriculture, Minnehaha Creek Watershed District, Capitol Region Watershed District, U.S. Forest Service Southern Research Station, and Cactus Communications.